Maybe you are one of the more than 11 million people who have already viewed this incredible "Marble Machine" video, by Swedish musician Martin Molin. 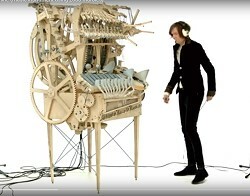 Molin designed and built his wooden music machine using aircraft plywood, ball bearings, Lego blocks, pressure transducers, plastic tubing, lengths of wire, springs, and a host of other off-the-shelf components, none of which appear to have required custom metal machining. The huge wooden gears were designed on his computer, ut out on a band saw, and assembled with glue and screws. 2,000 metal marbles are the lifeblood of the instrument which, by function, must be classified as percussion. Even the integrated base guitar is 'played' via striking by marbles a la hammers hitting piano strings (which is a percussion instrument). In fact, the way each event is triggered is exactly the way a wind-up music box mechanism works with little protruding nibs controlling timing and initiating tones. Mr. Molin's innate sense of 'how-to' is demonstrated in devising a method for creating a snare drum effect with grains of rice and achieving vibrato on the xylophone with variable-geometry resonance slot. Most, I will guess, have only watched the final production - which had me nearly mesmerized and awestruck by the juxtapositioning of mechanical design genius, a keen musical sense, the ability to create and implement hardware, and even having a handle on integration of electronic sensors. This is the penultimate realization of a Rube Goldberg contraption and a Dr. Seuss creation a la those played by "the Whos down in Whoville." As an RF Cafe visitor, I assume you are interested in the details of the Marble Machine's evolution and operation. Therefore, below the main video are posted some of the accompanying videos showing how the whole thing came together.